If there’s one thing I’d love to do when I grow up it would be to have a bunch of chooks running around the yard. We have the space, but right now looking out at all the snow my head just spins with the practicalities of it all. Build a barn? Heat it? HEAT IT??!! Keep the poor guys indoors for months at a time till the snow melts? Not to mention the eggs-are-fine-but-there’s-no-way-I’m-eating-our-pets family discussions. And the what-do-we-do-when-we-want-to-go-away bit. On the other hand there is only one (ONE!) 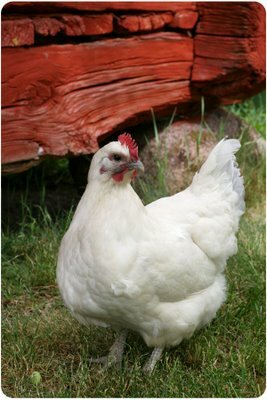 supplier of organic chickens in Sweden. They cost a fortune and have a fair few transport miles on them, but are just delicious. And I think we feel better if the animals have lived well. But someday, somehow we’ll solve this chicken dilemna and find a way to stock the yard! Meanwhile, I’m rather curious about the whole Bokashi+Chooks concept. Seems like it’s an interesting combination and is probably more widespread than we realise in Asia and other parts of the world. One option is to feed the chooks Bokashi bran direct (the same stuff you would use in your bucket). The effective microorganisms (EM) in Bokashi work as probiotics in the digestive system of the animals and help them feel better, stay healthier and lay more eggs. You can also spray liquid EM in their drinking water for a similar effect. In Japan at a farm run by the Konohana family, they mix Bokashi bran into the bedding and create a warmer, healthier environment. If you’re interested, there’s a Bokashi thread starting here on a Guinea Fowl forum (who would ever know such things existed? The forum I mean, not the guinea fowl…). There’s also quite a bit of info on the EM sites in the US and New Zealand (links to the right). The Latin America EM site is also excellent. These guys in the UK are selling Bokashi bran to people with hens, so the concept is far from new. What’s particularly interesting is how EM/Bokashi also starts the process of soil improvement right there in the chicken stage. Chicken poo is great for the garden but too strong to use directly, too acidic. The EM helps balance this out so the fertiliser is more “useable”, so on top of happy chickens we get the added bonus of happy soil. More here too from the guys at Wiggly Wigglers in the UK. Wish I had some chooks so I could test myself. But maybe you have? It would be great to hear what you think!